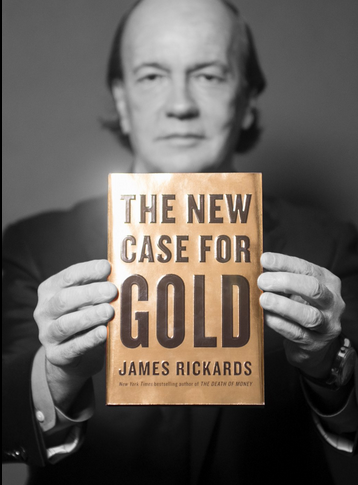 A synopsis of an interview with Jim Rickards, New York Times bestselling author of The Death of Money, Currency Wars, and the newly released bestseller The New Case for Gold by Francine Lacqua at Bloomberg. Jim thinks of gold as a form of money and not as an investment. As money it competes with other kinds of money — the dollar, euro, yen etc.. They’re like horses going around a racetrack. Investors are losing confidence in central banks. That’s what’s been going on and been clearly revealed. Central bankers have told Jim that they don’t know what they’re doing and they sort of make it up as they go along;. They experiment. President Evans of the Chicago Fed has said this and others have said it privately. Ben Bernanke described that everything he’s done was an experiment — meaning you don’t know what the outcome is. Gold does well in a world where investors lose confidence in central banks. Right now there are tens of trillions of dollars of sovereign debt with negative yeilds to maturity. Zero is higher than a negative so gold is the high yeild asset in this environment. Both gold and stocks are going up, and the reason stocks are going up is because Janet Yellen is going “full dove”. There’s nothing the stock market doesn’t like about free money. Plus negative interest rates might be on the table for next year. That’s bullish for stocks but it’s also bullish for gold. Sometimes gold and stocks go up together and sometimes they don’t. There’s no long term corollation, but right now in a world of easy money and negative yeilds it’s good for both stocks and gold. The technical level for gold is $10,000 U.S. per ounce. That amount gets bigger over time because it’s a ratio of physical gold to printed money. The amount of physical gold doesn’t go up very much, but printed money goes up a lot, so the dollar target goes up more over time because of all the money printing. $10,000 U.S. per ounce is the implied non-deflationary price for gold. If you have to go back to a gold standard, or anything like it to restore confidence, that is the number you must have to avoid deflation. So $10,000 per ounce is mathematically derived and is not a guess. If Janet Yellen begins to normalize then it would probably throw the U.S. into a recession. A 25 basis points hike in December threw the U.S. stock market into a 10% correction. The U.S. is hanging by a thread. It looks like first quarter GDP is going to come in at well below 1% according to the Atlanta Fed Tracker. What’s the difference between -1% and 1%? Technically not much. One may be a technical recession and one is not, but growth is extremely weak. You don’t raise interest rates in a recession. You’re supposed to ease in a recession. International spill over as well as the U.S. economy being fundamentally weak is the reason to not raise rates. The time to raise rates was 2011 and that’s long gone. But two wrongs don’t make a right. The Phillips Curve seems to have broken down — if it ever existed. The bigger play is what Jim calls the “Shanghai Accord” which came out of the G20 meeting in Shanghai, China in February 2016. It’s like a secret Plaza Accord between the U.S. Fed, the Bank of England, the Peoples Bank of China, the European Central Bank and the Bank of Japan. But the last two times China eased, August 2015 and December/January 2016, the U.S. stock market fell out of bed. So how do you ease China without destroying the U.S. stock market? Keep the dollar/yuan cross rate unchanged. Then ease in the U.S. dollar so that China goes along for the ride. At the same time tighten Japan and Europe, so you get a stronger yen and a stronger euro. China is a larger trading partner for Japan and Europe than the U.S. is, so it’s a backdoor easing for China. The degree is done, and it was an interesting experience doing university backwards. I built a publishing and production house in Vancouver, Canada, then sold my half and went back to school. The world is different now, and the students’ viewpoints changed dramatically even over the five years I attended. The digital vs. analog upbringing together with the different parenting styles goes nicely with the Roman view of a seculum. Everything goes through seasons. A society’s seasons just go a little slower than an individual’s. It’s all like 3D cycles moving around at the same time as they push out to conquer ground and return home for dinner. Like electromagnetic sine waves and pressure waves going on at the same time. The more of the world I see the more I believe everything moves to the Rod and the Ring. I’m off to the deserts of Nevada to see the world of gold in the desert first hand. Last year was the rainforest of B.C. and this year is the desert. It’s a beautiful world, isn’t it? Stay tuned for the 3 Minute Gold News coming in a new form. And music and beautiful things for our beautiful world. 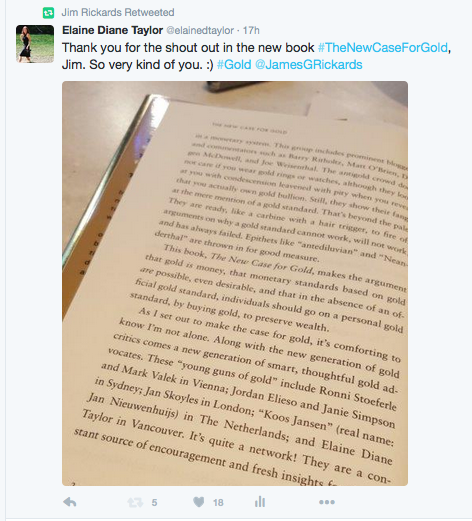 And thank you again to Jim Rickards for the shout out in his new bestselling book, The New Case for Gold. 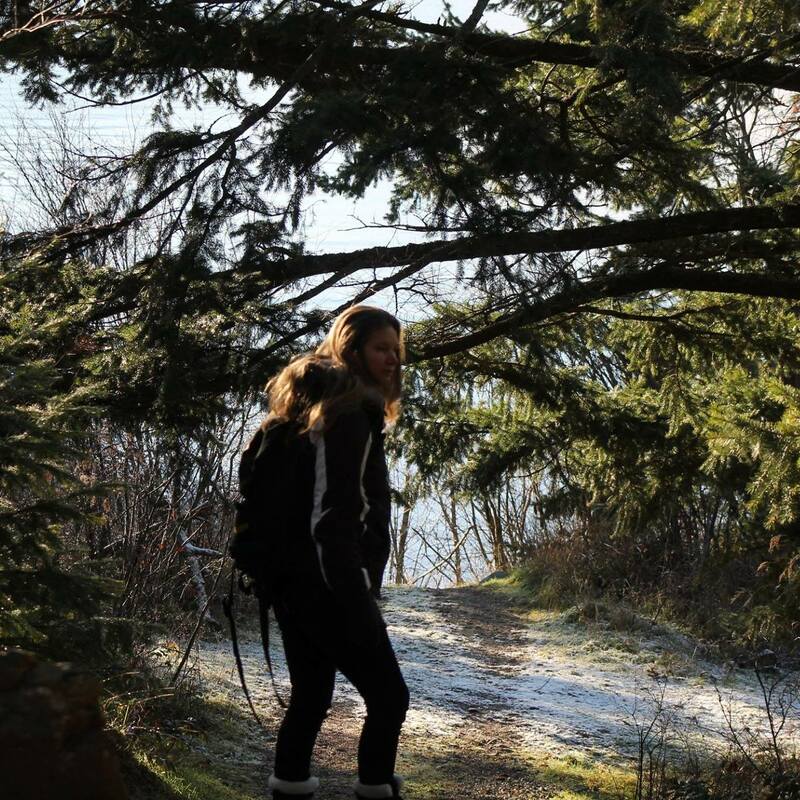 Looking forward to another hike up the Grouse Grind in Vancouver in July.